Beading Arts: Calling all seed bead fans! 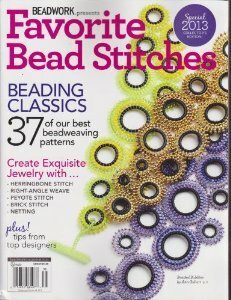 Available now on newsstands until the end of October: Beadwork Presents Favorite Bead Stitches. This special edition magazine contains 37 of the very best and most popular beadweaving patterns from 2010 to 2012. You'll especially want this volume if you don't subscribe to Beadwork, or have only started recently. Or if you'd like to have all the best of the best in one volume, here they are, grouped by stitch. Favorite Beading Stitches includes brick, herringbone, netting, peyote, and RAW, plus priceless tips on embellishing and using some of the newer shaped beads. You'll find many of your favorite designers included!